Over the years I have been in Phuket, I have done less and less diving. I came here in 1999 as a dive instructor looking for work (read more here: First Dives in Phuket), and over the years I have logged over 1,000 dives in the area, but very few in the last few years. Work is now computer based - emails, websites... way more people book online than a few years ago. Right now I am working on a new web design for Sunrise Divers (I mean, the design was done by a professional company, I'm just dotting the i's and crossing the t's) - the finishing touches will probably take most of June, but this afternoon, on another lovely sunny day in Phuket, I decided that next week I must go diving. There was a little launch party in Chalong Bay for a new dive boat, which for the low season will be doing daily dive trips to Racha Yai island. So, if there's time, if I can tear myself away from the computer for a day then a couple of nice easy dives would be nice. 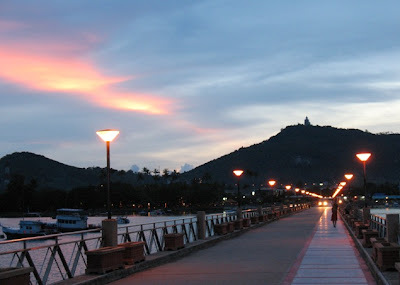 The evening was clear - the view below is looking along Chalong Jetty with Buddha Mountain in the background.